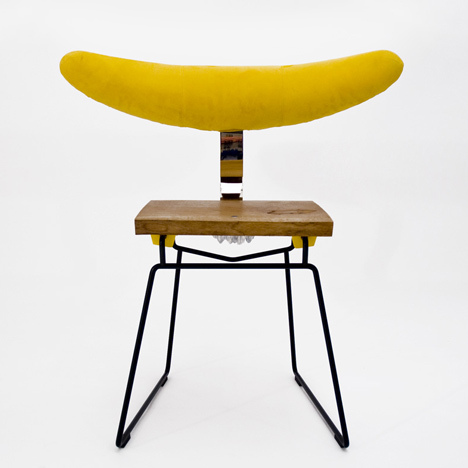 Sheffield Institute of Arts graduate Guido Garotti will present a series of chairs at New Designers in London next week. Garotti selected materials for each component based on the effect they could have on the user's memory. For example, oak was used to age gradually, while the nap of suede shows where it has recently been touched. The project will be on show at New Designers 8-10 July. Long-term relationships with the objects we possess stimulate our affective life, offering a closer psychic symbiosis between person and object. However, today’s throwaway culture denies artefacts the opportunity to become meaningful partners in the adventure of our life and be part of our history. My aim is to create objects that have the ability to stimulate - through their use - the desire to be kept. This set of chairs is designed along the principles that I found to be valid arguments for emotional durability. Each chair differs from the others featuring a dedicated universe of subtle details that aims to establish a privileged long-term relationship with its user. Four different chairs were designed, however, at this moment, two of them have been engineered and realized. Materials will age gracefully mirroring the user’s existence. Oak will age beautifully offering the chance to be loved and cherished with dedicated aftercare. Suede’s brilliant short term memory system stimulates ownership and a sense of belonging by displaying traces of the user’s presence. The joining system offers room for interaction. By placing the clamps in different designated spots the user can modify the general give of the chair. This mindful intervention - as a form of customisation - consolidates the bond between user and object through emotional investment. Many informative details encourage a privileged partnership. Through a certain degree of access into the chair’s existence, the thoughtful user will develop a feeling of higher understanding of it; as a result, the boundaries between user and object weaken. A mysterious attitude confers a durable appeal. Many features exhibit a mysterious attitude: strong elements of continuity with something unknown, not visible, or simply not there. The user is part of an inspiring narrative and will complete the project with the uniqueness of his mind.